Defeated a monster who killed your parents? Check. Managed to graduate high school? Check. Get a super cute and kind boyfriend? Check. Welcome back to the world of fairytales, a world which Albany French, the heroine of this story, is very used to by now. 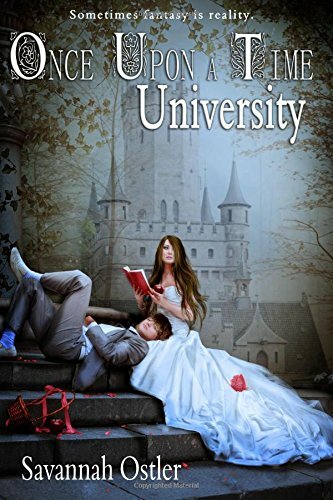 After graduating Happily Ever After High School, Albany returns in the sequel, Once Upon a Time University, which can definitely stand alone from the previous book. After getting settled on campus, Albany gets swept into the whirlwind of tournaments, amazing friends, and the cute dimpled face of her boyfriend. But as you should very well know by now, things are not always as they seem. A disgraced teacher, a heart-wrenching breakup, and creepy letters are among the things that Albany has to endure, but by keeping one eye on the finish line, this University stand-out might just get that Happily Ever After she deserves. Once Upon a Time University has a fairytale basis with a sneak peek at real life on a university campus. The characters in this book fit together very well. Placing tragedies here and there only tests Albany's endurance and shows the readers how far she is willing to go to help, save, or defeat someone else. All good books must have a plot that draws you in and this book has and did exactly that. I hope you enjoy this fairytale campus like I did. Happy Reading! This book has violence such as fighting and the use of weapons.